I've been off peppermint for a while, again, now i'm back. My Asus E403S has this weird little hiccup, that about half of times, this wont shutdown. It get stuck in that shutdown .. white... line.. thingie. so.. where should I start to fix this? ok.. edit.. funny fact. I made it so that when I push the power button.. computer should shutdown. Well.. this get things stuck. if I go the ... menu - log out- shutdown.. all work. EDIT 2. forget that.. it turns out.. that no matter the method, 80% times the shutdown get stuck. b) If you hit the Esc key whilst shutdown appears stalled .. is there any writing displayed on screen ? ok.. edit.. funny fact. I made it so that when I push the power button.. computer should shutdown. Well.. this get things stuck. if I go the ... menu - log out- shutdown.. all work. So what are you saying here, shutdown works perfectly if triggered in the normal way .. but ONLY doesn't work if you use the power button to shut down ? Well. that's what I was saying, but since I've learn that I was wrong. it's about 80% times, no matter the way I shutdown, that the process get stuck. Just a second or so after hitting shutdown (as soon as the "Shutting Down" screen appears) hit Esc .. can you see text relaying the shutdown process ? reboot, and poweroff respectively ? sudo poweroff -f = computer shutdown fast. 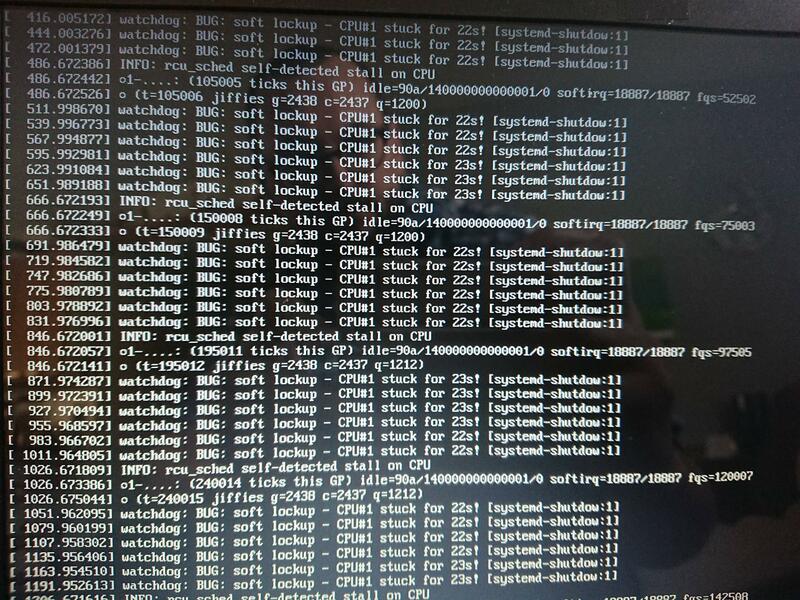 Sudo reboot -f = get's stuck without the shutdown window. Is there someway to get that info, what it give when shuttingdown (but wont) .? I took a photo it, but I have no idea how to add it here anyhow. I have strong believe that with Linux, everything can be found from somewhere? That's what happens when it tries to shut down. prior to shutting down, and THEN see if it shuts down properly ? BUT does it really matter since 5/5 times it shuts down properly. How can I make this permanent? then does it shut down properly consistently ? result in a consistent shutdown ? In effect I'm trying to figure out if it's the wireless card/driver .. or the Intel management engine/driver that's at the root of the issue. 5/5 .. full and painless shut down. I repeat. 5/5 full and painless shut down. ## BEGIN manually blacklisted mei and mei_txe to solve shutdown issue. ## END manually blacklisted mei and mei_txe to solve shutdown issue. once that's finished, reboot a few times to test. If you ever want to UNDO these changes, remove the 4 lines you added to blacklist.conf, then run the update-initramfs command, then reboot. Thank you so much. 10/10 everything shutdown as it should.